Letter writers address evolving noise issues that have affected residents in both White Rock and South Surrey. What happened to peaceful White Rock? Twenty-five years ago we purchased a hillside home, our dreams came true. We could sit on the deck, enjoy the sea breezes, the quiet and know all our neighbours. How things have changed, especially the last few years. We now listen to continuous horn blowing from the trains – and the latest annoyance, the helicopter patrolling the waterfront all day long – all because our mayor thought he could get brownie points taking on Burlington Northern and Transport Canada when a couple of careless folks got in the way of a train, a no-win situation. This railway was here when we bought, and way before our mayor took office, and we never had problems adjusting. There is always going to be accidents, whether on 16 Avenue, Highway 99 or the railway. People are ultimately responsible for their safety. We teach our kids to look both ways; adults should remember that. This rail line will not be relocated in my lifetime, or yours, so get used to it. On July 29, I was rudely catapulted out of bed at 5 a.m., the horn of the BNSF once again. That was already after three days that this had been repeated. I had only had five hours sleep and I was distraught. I waited a few hours before contacting the BNSF, where I was shuffled from one department to the other, only to be kept waiting and eventually be hung up on. I finally gave up as I felt it was futile to try to get someone to listen. Lo and behold, I picked up PAN and noticed the letter, Thoughts on Noise Pollution (July 29). Thank you, Ole Nygard, for your letter on noise pollution. I finally realized there are others out there who understand. I’m not sure who is responsible, but I would like to thank whomever managed to quiet the whistles of the trains that run along the foot of Panorama Ridge. We’ve had several weeks now of peace and quiet, and when we do get the odd single bleat of a whistle it reminds us of what we have put up with over the years. Thank you for reporting on the topic of rail relocation. I am a resident of Crescent Beach. Twenty BNSF trains rumble through the community every day. Oh how wonderful it would be if the trains were relocated away from Boundary Bay. Re: Beachfront chopper tours irk residents, July 27. The first time I head the ongoing helicopter noise, I was worried that there was a tragedy on the beach or a police incident in progress! I went online to the PAN to see if there was a news update. I am not a waterfront condo owner. I live up the hill at Five Corners, and the ongoing noise of helicopter tours is intrusive and annoying. If I chose to live near an airport, I would expect to have to put up with air traffic noise, just as I accept the train noise because I knew it was a fact of life when I chose to buy a White Rock condo. But I chose to live in a small urban community with the quiet feel of a village. So much for that. 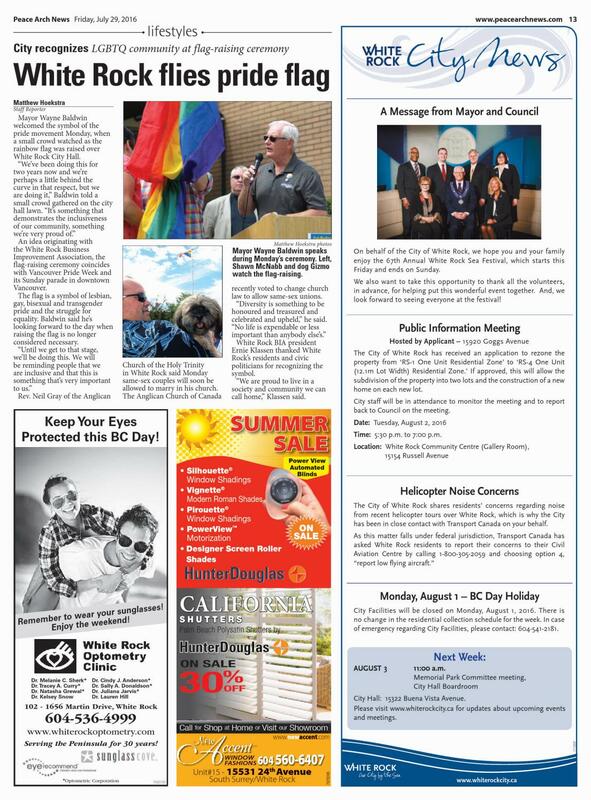 I note the White Rock City News advertisement in the PAN of July 29 stated that the city shares residents’ “concerns” over these helicopter rides and has been in “close contact with Transport Canada” over this matter. They were also nice enough to provide a phone number for Transport Canada so we may voice our concerns. What a way to wash one’s hands of a public issue. Perhaps the city, if it actually shares residents’ concerns, could have contacted the Semiahmoo First Nation band over the matter. The problem lies with the band and TRK Helicopters who have entered into a business agreement knowing full well the concern of the citizens over the noise offers no consequence to either of them. Surely the City of White Rock council could intercede on behalf of its residents with the First Nation in an endeavour to bring this noise pollution to an end.